Wow, this wall took me a really long time to finish, and went through a LOT of incarnations and revisions before it got to the present state that I'm happy with. It actually started out featuring both Mai and Natsuki, but eventually I decided to split it up into two complementary walls (the other one can be found at http://gallery.minitokyo.net/view/96318/). Anyway, I found the scan on Minitokyo (http://gallery.minitokyo.net/view/49185/), so many thanks to jasmine for providing that. Other than the scan, everything is 100% my work. This wall (and its sister wall featuring Natsuki) was the first one where I tried anything as ambitious as making the wings myself, and I think it turned out pretty well. waaaahhh i love this wallpaper of Mai Tokiha . Very nice job ^^ !!! Nice wall I like the background the nice effect witht he white and blends into the blue. Also I like the wings on Mai. Nice job keep it up, Fav. Cool wallpaper been made here. 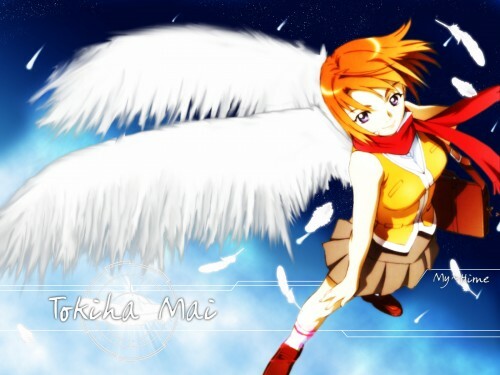 I like the wings on her and the background but the techie lines and circle is just not right there. But it's still good. +Fav. Nice work. I like the fade from space through atmosphere to a sunny sky on this. Very nice work. And a great part one. Wow, those feathers look great. Very nice work :D :D.
Like the way you added the wings. They look very realistic. Wow great job on this wallpaper. I like the wings and the background looks good. I love the wings on Mai's back. It's very beautiful. Nice work.